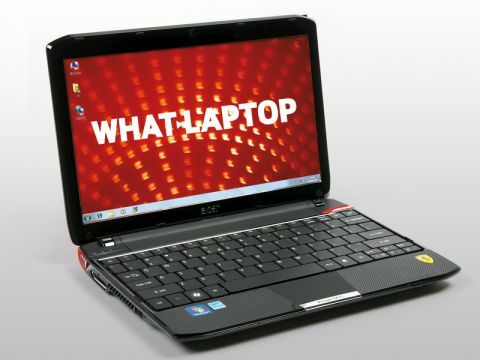 Acer's Ferrari range has traditionally been made up of high-end ultraportables with expensive price tags to match. The Acer Ferrari One is considerably more affordable, bringing the Ferrari brand to the masses. It's a stylish and well-made product with high-quality plastics and a cohesive design that creates a premium feel. Not everybody will appreciate the Ferrari branding and oddball design touches – such as the rubber feet that feature a tyre-tread finish or the bright-red lid and prancing horse badges, but to our eyes it's an attractive netbook. The 11.6-inch screen is impressive, with a sharp 1366 x 768-pixel resolution. It's one of the brighter panels we've seen, although colour reproduction could be better straight out of the box. We found slight issues with contrast and some colours looking over-exposed. The Windows 7 software includes colour calibration tools, however, and we found it easy to adjust the screen, producing vivid images after slight adjustments. It's also more than capable when it comes to video playback, with the ATi Radeon HD 3200 graphics chip making light work of movies. It'll even run HD films without issue – something that can't be said of most netbooks that use Intel's previous-generation GMA 950 chipset. The keyboard offers keys that are among the largest we've seen on any netbook and are ideally suited to users with big fingers. It's high quality, with the keys moving responsively and quietly. It won't suit everybody, however, as the keys are completely flat – and the lack of definition make it easy to make mistakes. Unlike most of its Intel Atom-based rivals, an AMD Athlon processor is used here. Running at 1.2GHz, the main benefit is that it's a dual-core chip – offering better multitasking capabilities. We found it smooth and reasonably fast, but while our review sample featured 4096MB of memory, base spec models will be sold with 2048MB. An additional 2048MB is available for £30. How much this will affect overall performance remains to be seen. The three USB ports are standard fare for a netbook, with a VGA port for an external display. Unusually, you'll find ATi's XGP port in place, letting you connect a compatible external graphics card for enhanced 3D performance. 802.11g Wi-Fi is included, although future models will also boast 802.11n Wi-Fi and Bluetooth. Overall, the Ferrari One is a highly attractive netbook. It's a shame that there aren't more features included as standard, but it still has a lot to offer. We were particularly impressed by the keyboard, screen and overall quality.